One of the joys of building this website is hearing from other modellers from other countries in the world. 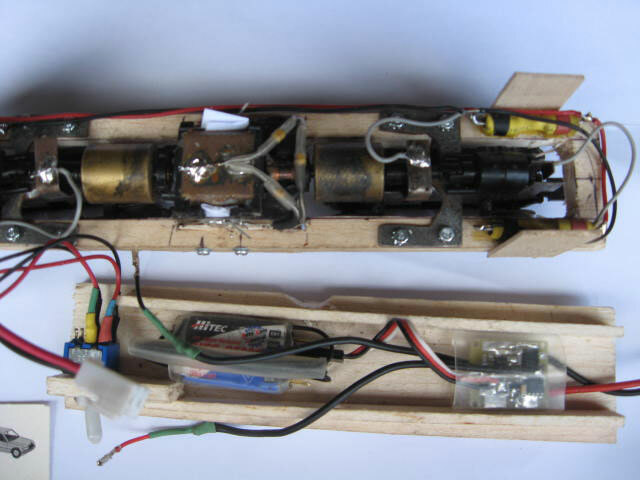 Ian Dolinski of Australia is one such modeller who sent me a fascinating email about his experiments with electronic speed control. I've seen radio control with larger G scale trains, but not in smaller scales such as HO or N scale. Ian followed up his email with photos and a short video clip. I found this so interesting I promised to give Ian his own page so he could explain it to you for himself. "The ESC has variable forward and reverse and are usually used in model cars, but they are usually only 9.6v. This one is good for 20vdc at 20amps continuous. It plugs into any radio receiver used for model cars, planes, boats, etc. I use a Hitec Optic 6 channel transmitter and a Hitec micro receiver in 36mhz. However, I am changing to a 2.4ghz module as micro receivers for 2.4ghz are a quarter of the size for 36mhz. 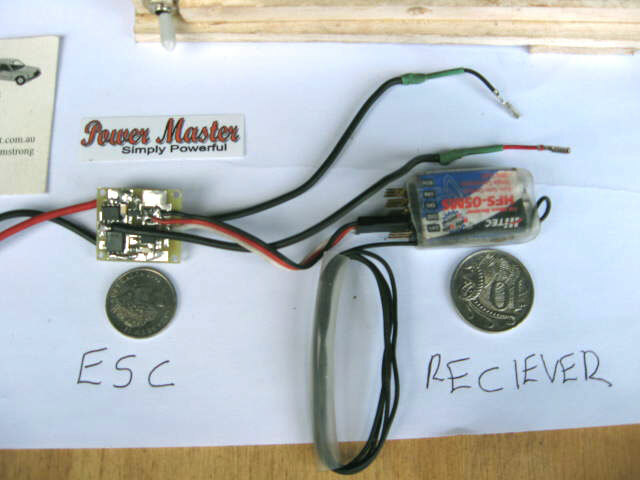 The ESC works by producing pulses to a motor, (pulse width modulation) (pwm). The ESC also has a battery eliminator circuit (bec) that powers the receiver from your main power battery or you can power from the track. 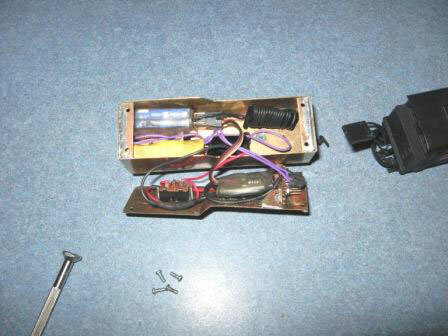 Two wires from the ESC plug into the power source, two go to the motor and the three wire lead plugs into your normal radio receiver. I am using channel two. I had the ESC especially built for an HO scale train to also be able to handle 20vdc. Here's the original test train setup. 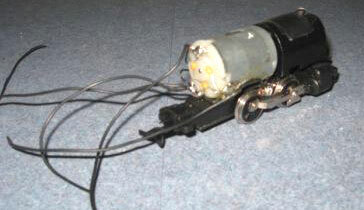 The locomotive and tender needed new wiring. The photos give an idea of the size of the components. As I am only using a little four wheel loco that has very little room to put anything in, I routed the left and right pickup wires to a full wave bridge rectifier in the wagon. There is a second full wave bridge rectifier in the wagon to pick power up from the wagon. Here you see how the components fit into the wagon (tender). In the centre stick position on the transmitter no power is supplied to the motor. Move the stick forward a little and it starts to supply power to the motor making the train creep off very slowly. Move the stick more and the train goes a little faster. Same for reverse. Simply move the stick backwards from the centre position and the train will start to reverse. How fast depends on how far you move the stick. For track powered dc like HO scale, I use two non-powered sections of track so my train can cross over to a reverse polarity without shorting. The non-powered isolation blocks are designed to stop the shorting between the wheels on the engine and wagon as it crosses over into a reverse polarity situation. 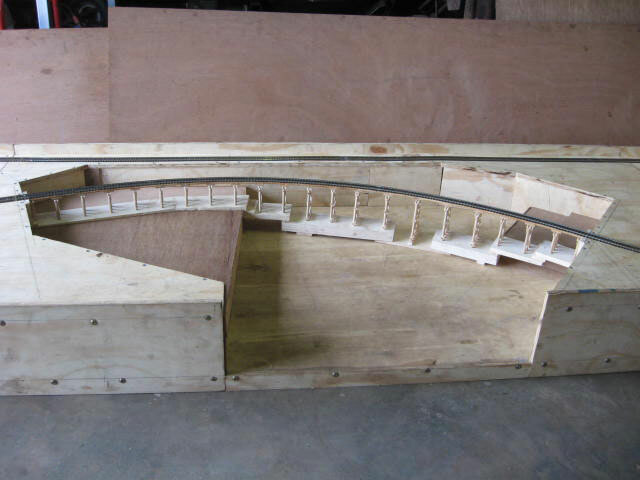 The measurements of the blocks are designed to cover N scale trains and HO scale trains. I am not sure about wheel spacings for 00 (4 mm) scale trains but I think the isolation block measurements will cover them too. I have tried my block measurements on an Athearn three-axle with twin bogies and on a two-axle four wheel loco which has a carriage with electronics in a wagon and they both worked perfectfly with this block spacing. Between the two-axle spacings and loco lengths I reckon I would have covered the shortest and longest axle spacings. The original train was made of bits found out in the rubbish. It looks digustingly ugly but it was beautiful to see it working. My train goes whereever I want it to without all that complicated stuff. For garden trains (G scale) I would recommend batteries and this would be even better than track power. One other point: I discussed with the man who made me the esc the use of super capacitors instead of batteries as they are a lot smaller and more powerful but, unfortunately, very, very, very expensive at this stage. They are coming down in price so this might be something to consider in the future. For example, a 15v supercapacitor 3 years ago (2008) was over $200(AUD). Now they are down to around $50 (AUD). After all, a capacitor is only a battery and a battery is only a capacitor." 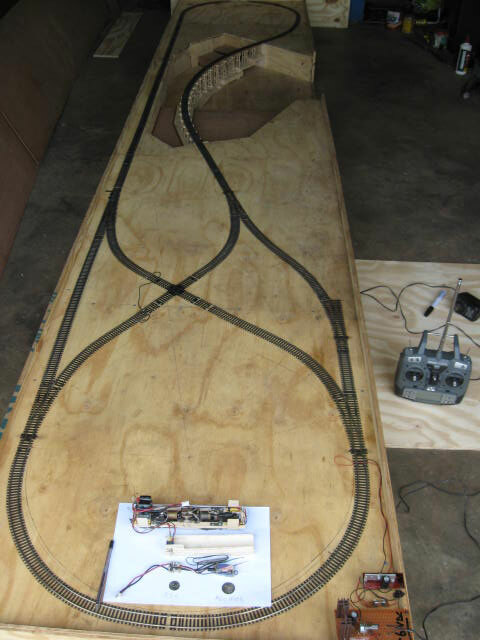 Ian sent a few other photos, one of a bridge he is building and an overview of his "bare bones" layout used for this electronic speed control testing. And finally, the test layout in action. Ian sent me a couple of pdfs explaining his work in more detail. They explain his new set up and a few other things including what he calls the MIB Block. This is simply an isolation block split into five separate sections and you use two of these as on his track layout. Ian says he has spent two years working on the measurements and various setups. There's a pdf of how to set up the isolation blocks for a triangular (wye) turnout as well. HO RC Train Specifications, Little 4-wheel loco information and reversing polarity in wyes . If you would like to contact Ian for more information and to discuss his project, his email is donnaandian@bigpond.com. 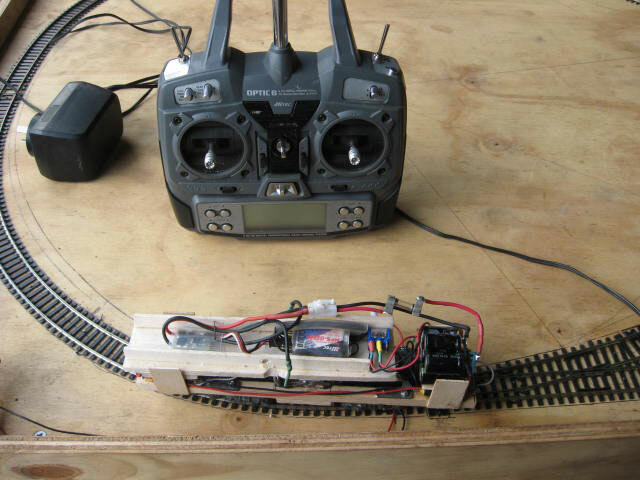 Go from "electronic-speed-control" to other radio control ideas. Go from "electronic-speed-control" to my Home Page.